We all like to spend some time outdoors and sometimes relax at home. Whatever you like you will need some things to help you relax and enjoy. We all like to sit in the garden, float in the pool or rest in the middle of nature and for all these activities a Laybag can be a valuable asset. In simple terms, it is an inflatable sofa/bed that you can use almost anywhere. For example, you can take it to the pool throw it in and relax on it. You can also take it camping with you and use it as a place to sit and also a place to sleep. It can handle 2 to 4 people or up to 200kgs. It is very easy to carry around like any backpack as its deflated weight is only 1.2kgs and 7 x 14 inches. When it is inflated, and it will change to 83 x 39 inches and will give its user an enjoyable place to rest. When you are outdoors and have set up camp near a lake, this piece of gear would be an excellent choice for sitting on the water or sleeping at night. It will give you the feeling of a mattress, and you will not have to deal with the insects that creep up on you at night as this bag will be elevated off the ground. It is rather easy to inflate and deflate, and it comes in a few different models too. Some of the models have illuminations which make it even more versatile for outdoor activities at night. Since camping requires that you take quite a bit of gear with you, you will not have to worry about adding too much weight with this versatile piece of equipment. It can be carried separate or even put inside a backpack. 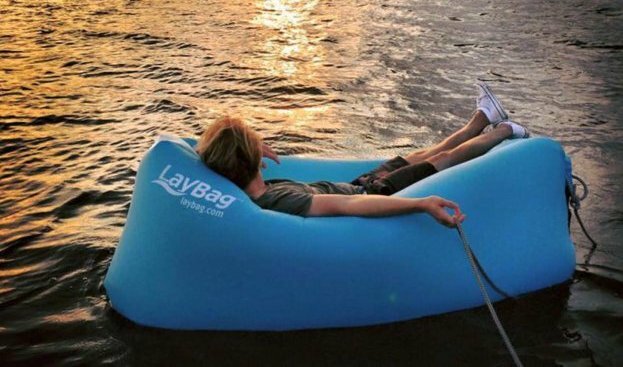 When inflated the Laybag will be an excellent floatation device for the pool or lake. It is very durable and will be able to handle the weight of a couple of people so sitting reading a book while floating in the pool is possible. This product uses materials that have been specially manufactured for it, and they are durable and can handle hard use. One thing you must keep in mind is that it must be fully deflated before you pack it up. It comes with a included carry bag which makes it east to take with your, and it will not take much space as well.